Most drinkers’ enjoyment of beer ends when their glass is empty. With these products and foods, though, you can keep on experiencing your favorite brews throughout the day. Looking for a way to spice up your soap dish? Beer can come to the rescue. 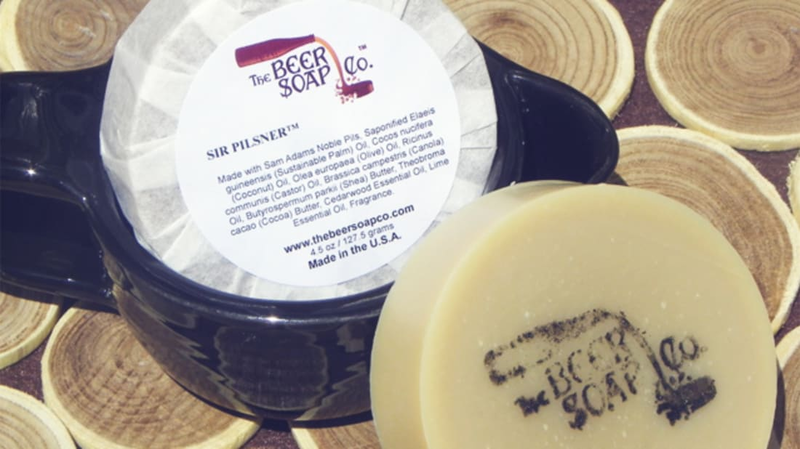 With a little poking around, you can find a soap made with your favorite brew. Beer soap devotees claim that the hops and brewer’s yeast in beer are terrific at soothing irritation while delivering a wallop of vitamins. They’re also a great way to add some revelry to your sink. Most people would frown at having a beer with breakfast. If you’re really enthusiastic about slipping some beer flavors into your morning cup of joe, Chicago’s Dark Matter Coffee has you covered. The roaster collaborates with local brewers to create something magical. You may have tried a beer that’s been aged in a whiskey or wine barrel to pick up flavors from the wood. Dark Matter takes things one step further by then using these post-beer barrels to age coffee beans, which acquire all sorts of complexity from the barrels’ previous tenants. If you love barrel-aged beer, give them a try. Buy at Dark Matter Coffee. The process of getting a delicious liquid into your glass leaves a lot of solid byproducts behind. While some brewers use these leftovers as feed for livestock, the company 3Dom USA has found a more technologically savvy use for spent grains: Transforming them into 3D printing filament. According to the company, the filament, Buzzed, lets DIYers print products with “a rich golden color and a noticeable natural grain.” The Bavarian-style beer mug they’ve printed with Buzzed is a whole new spin on authentic drinkware. Drinking beer and driving never mix. But beer may someday have a use in your car. Last summer, New Zealand’s Gull gas stations offered drivers a chance to fill up with Brewtroleum, a mixture of alcohol and gasoline. The ethanol component of the mixture came from local brewer DB Export, which uses the leftover yeast from beer brewing to create the alcohol. It’s not clear if the technology behind Brewtroleum will ever scale up to the point at which it could be a significant source of fuel for drivers, but it’s good to know there’s always another use for beer’s leftovers. Even if you skip on the aforementioned marriage of beer and coffee, you can still enjoy beer flavors at breakfast. Vermont’s Potlicker Kitchen uses real beer to create jellies that are perfect companions for toast, cheese, and anything else that could use a bit of sweetness. If you’re really ambitious, you can also make your own. Take a beer into the shower with you with Tasmanian company Beauty and the Bees’s beer shampoo bar. The company touts the bar’s ability to revitalize dry hair, and if you look closely, you might even spot some flecks of additional hops they add on top of the local Australian brew. Chocolate can be great when paired with your favorite beer, but Brooklyn shop Nunu Chocolates goes the extra mile by mixing craft beers into its ganache. The resulting sweets are the perfect excuse to make your next beer tasting just a little more decadent. If ganache isn’t your thing, Vosges makes its own spin on beer chocolates with the Smoke & Stout Caramel Bar. If you’ve ever enjoyed a beer after mowing the lawn, you may be surprised to learn that your lawn might have wanted a sip of its own. The Internet is home to many DIY fertilizer recipes that include beer, often in conjunction with ammonia and other sweet ingredients. The efficacy of these lawn tonics may be questionable, but some gardeners swear by them. You can elevate your beer-and-burger game with pickles from Brooklyn Brine Co. that use actual India pale ale and Cascade hop oil to create pickles that will win the heart of any drinker. Want to enjoy peanuts with your beer but don’t feel like a salty snack? Beer brittle is the perfect compromise. There are countless recipes out there to help turn your favorite beer and nuts into a sweet treat—including this tasty one that incorporates bacon and cayenne pepper. You can also skip the kitchen by buying your own commercially created beer brittle. Food writer Jackie Dodd’s site TheBeeroness.com is loaded with inventive, delicious ways to use the beer you love to inject more flavor into your cooking. It would be a challenge to pick the recipe that looks the most tempting, but at this time of year, it’s hard to pass up the Holiday Ale Candy Cane Truffle Fudge. Find more recipes at TheBeeroness.com.